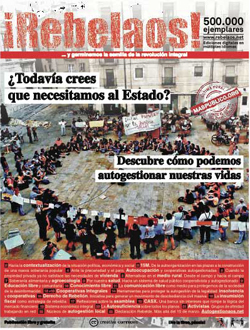 On the 17 of September 200,000 copies of this publication where launched on the internet and on the streets of Catalunya, in which the origins and mechanisms of the crisis where identified.. In it it, Enric Duran’s direct action was made public: the expropriation of 492,000€. The article was titled :”I have robbed 492,000€ from thos who are robbing us to expose them and start creating alternatives”. In the article it was explained how this action was taken, asking for 68 loans from 39 banks. 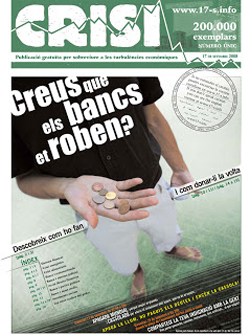 On the 17 of March 2009, 350,000 exemplars of a second publication see the light, in which a number of alternatives to the crisis were presented. In this publication there is the first mention of the Integrated Cooperatives, and the proposal of creating many local cooperatives, something that later was changed in order to make a collective use of the model and create a network thorough out the territory. 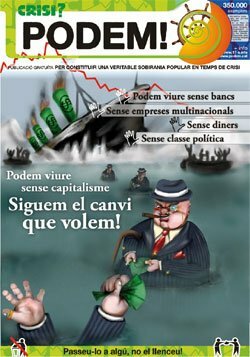 On the 15 of March, 500,000 copies of this publications were distributed on the whole peninsula, 20,000 in Catalan and 300,000 in Spanish. This publication exorted people to free themselves from the State, and offered alternatives. Also in this edition, many themes related to the daily life of people were addressed, offering alternatives and solutions beyond the idea of community. Details are offered about the structure and workings of the Integrated Cooperatives and visibility was given to all the Cooperatives which are emerging around Spain. Also there was the introduction of an ethical bank without interests, and also the idea of creating a cooperative of journalists and readers to create an independent and popular means of communication. On the theme of housing we proposed some solutions for those affected by the mortgage crisis.